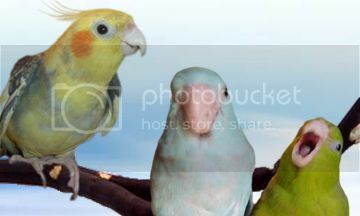 Little Feathered Buddies • View topic - Flavor for a perch? Post subject: Flavor for a perch? I am getting couple of those for my birds and don't know what flavors to choose. I am certainly getting Watermelon as a lot of people said it was their birds' favorite. They also have Grape and KiwiLime. 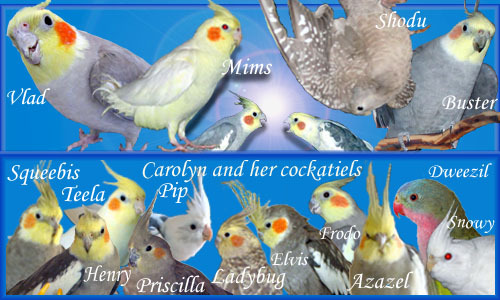 Which do you think cockatiels would prefer? Post subject: Re: Flavor for a perch? They might not care. Birds are thought to have a poor sense of taste, and cockatiels aren't keen on fruit because it's not part of their wild diet. They at least sit on the new perches (which is handy -- we need more sitting places with so many birds) and some try to nibble on them. Calcium Carbonate, Bentonite Clay, Bee Pollen, Potassium Chloride, Dicalcium Phosphate, Sodium Chloride, Sodium Silicoaluminate, Dextrose, Natural Grape, Kiwi/Lime, or Watermelon Flavors, Potassium Iodide, and Sodium Bicarbonate. Sodium Benzoate, FD & C Blue #1, and natural flavors. Are they safe for my birds to use? I was fooled by so many positive reviews. Will be contacting Dr Foster and Smith about their very inaccurate description! There's nothing dangerous there, but they should have put an accurate description on the website.